"Beyond the Club: Re-historicizing Women in Abstract Expressionism"
"Beyond the Club: Re-historicizing Women in Abstract Expressionism" celebrates the work of women in the development of abstract expressionism's New York and San Francisco schools. Featuring the artists Lee Bontecou, Gretna Campbell, Helen Frankenthaler, Helen Gerardia, Elaine de Kooning, Lee Krasner, Julie Mehretu, Louise Nevelson and Mary Lovelace O'Neal, "Beyond the Club" presents a history which features and resists canonized dialogue of the mid-twentieth century movement. 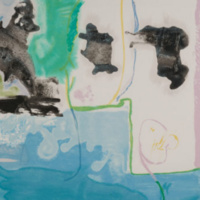 Image: Helen Frankenthaler (American 1928-2011). "West Wind," 1996. Silkscreen in 37 colors. 41 1/4 x 35 1/2 inches. Gund Gallery Collection; gift of Mr. and Mrs. Graham Gund ’63.